1. 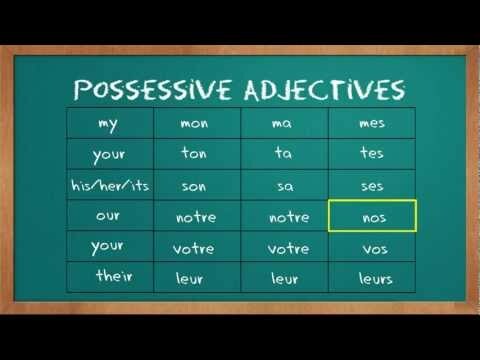 The possessive adjective's ending is always determined by the word directly following it. 2. You never use ma, ta, sa in front of a word starting with a vowel or mute h, even if the related noun is feminine: you use mon, ton, son instead, to ease pronunciation. Mon aventure est une aventure passionnante. My adventure is an exciting adventure. J'ai une horloge qui est plus grande que ton horloge. I have a clock which is bigger than your clock. Son opinion est une opinion intéressante. His opinion is an interesting opinion. When ma, ta, sa is followed directly by a feminine noun starting with a vowel or mute h, it becomes mon, ton, son. C'est ton amie ? - Non, c'est ma petite amie. She is your friend? - No, she is my girlfriend. Il se souvient de son enfance, sa belle enfance. He remembers his childhood, his beautiful childhood. C'est mon hypothèse. - Oui, ta mauvaise hypothèse ! That's my hypothesis. - Yes, your bad hypothesis! If ma, ta, sa is followed directly by an adjective starting with a consonant, even if the related feminine noun starts with a vowel or mute h, it remains ma, ta, sa. J'ai goûté ton excellente tarte aux pommes ! I tried your excellent apple tart! Tu as rencontré mon horrible tante ? Have you met my horrible aunt? Tu as vu son énorme verrue? Did you see her huge wart? If ma, ta, sa is followed directly by an adjective starting with a vowel or mute h, even if the related feminine noun starts with a consonant, it becomes mon, ton, son. How do you say "silvie talks to her friend" where the friend is male? The personal pronoun is also "son". Therefore "you cannot say" is the correct answer! Non? Although the possessive adjective would be "son" in both cases, the noun would be different - "ami" instead of "amie". So you know the friend is a woman in this case. Of course they're both pronounced the same, so if it were spoken rather than written then "you cannot say" would be the correct answer. Thanks Alan, now i get it. In a similar kwi zig question: le professeur parle a son eleve, the eleve could be male or female. Oui?